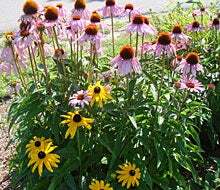 Wildflower gardening in the Northeast continues to gain in popularity and an understanding of the basic botanical environment is important. The Northeast is part of what botanists call the Great Northern Forest, and was solidly wooded when European colonists arrived. So it follows that most native wildflowers were shade-loving woodland perennials that enjoy somewhat acid (woodsy) soils, like the trilliums and violets. But when heavy settlement began, our ancestors cleared forests to create farmland. And in those spaces, they planted crops. In with the crop seed they brought with them, were the seeds of European "weeds", so these sun-loving flower seeds immediately grew and made themselves at home. This is why Northeastern wildflowers today are a mixture of natives and "naturalized" flowers from other places. For example, goldenrod and are native; the and are from Europe. So what we see in a beautiful blaze of color along roadsides today is a mixture of the two. With a short growing season and cold winters, the Northeastern landscape today retains its original forested history, so annual mowing of your wildflower meadow in fall is all-important. Any unmowed meadow in the region will revert to forest in about seven years. This is dramatically different from the wildflower habitats in the Great Plains and on the southern California coast which are natural grasslands and have never had solid stands of trees.